CDK7 antibody LS-C343914 is an unconjugated rabbit polyclonal antibody to CDK7 from human, mouse, rat and other species. Validated for WB. CDK7 antibody was raised against a synthetic peptide corresponding to a sequence at the C-terminus of human Cdk7(329-346aa RKRTEALEQGGLPKKLIF), different from the related rat and mouse sequences by two amino acids. Contains 5 mg BSA, 0.9 mg NaCl, 0.2 mg Na2 HPO4, 0.05 mg Thimerosal, 0.05 mg sodium azide per 100 ug antibody. Cdk7 antibody Western blot. Lane 1: HELA Cell Lysate. Lane 2: MCF-7 Cell Lysate. Lane 3: A549 Cell Lysate. Lane 4: COLO320 Cell Lysate. Lane 5: JURKAT Cell Lysate. 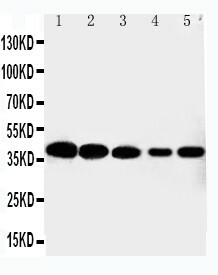 Cdk7 antibody Western blot. Lane 1: Rat Testis Tissue Lysate. Lane 2: Rat Ovary Tissue Lysate.